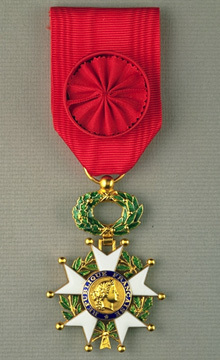 The Legion d'Honneur was founded by Napoleon Bonaparte on May 19, 1802. It was France's highest honor. The award came in five grades. The two lowest, the Officer's Cross and the Knight's Cross, could go to the younger combat officers and the Knight's Cross could also go to non-commissioned officers and men under exceptional circumstances. It was also awarded to French citizens and foreigners for outstanding service of a civil or military nature. There was no distinction on the medal itself to differentiate between military or civil award.